Compared to getting a new passport, renewing an expiring passport is a relatively simple affair. However, since it’s not something you have to do often, it’s common to have questions about the process. When it comes to getting a US passport renewal, here are some of the most common questions people ask, along with clear, easy-to-understand answers. When Should I Apply for My US Passport Renewal? Passports issued to adults over the age of 16 are valid for 10 years. According to the State Department, the best time to renew your passport is about nine months before it expires. That may seem like overkill; after all, nine months is the better part of a year, and shouldn’t you get the ten years you paid for? However, if you travel overseas with any frequency at all, it’s a good idea to follow the Department of State’s advice. Many countries won’t allow you to enter if your passport has less than 6 months to go before it expires, and applying for your US passport renewal nine months beforehand allows plenty of time to get the new passport issued before you start to run up against that six month limit. Where Do I Renew My Passport? Your current US passport is still in your possession and has not been lost or stolen. Your current passport is in good condition. Your current passport was issued after you turned 16. It has been less than 15 years since the passport was issued. If your name has changed since your last passport was issued, you are able to send legal documents that support your name change request. Where applicable, legal documents such as a marriage certificate or a divorce decree to back up any name change requests. Money to pay the fees. 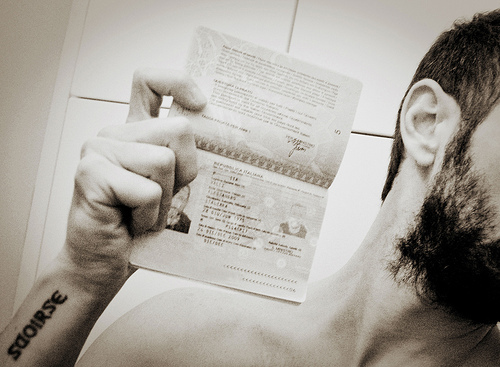 If you’re applying for only the standard passport book, you’ll pay an application fee of $ 110. At just $ 30, the passport card may seem like a bargain, but keep in mind that you can’t use it for international air travel at all. It can only be used for land and sea travel to the following regions: Canada, Mexico and the Caribbean. If you want both a passport book and a passport card, you’ll pay $ 140. Processing times vary seasonally depending on the Department of State’s workload. However, it usually takes about 6 weeks for a US passport renewal request to be completed. You can apply for expedited service by paying a $ 60 expedite fee in addition to your application fee and writing “Expedite” on the envelope. Expedited applications are generally processed within three weeks. For emergency passport renewals, you can make an appointment at one of 25 regional passport agency offices across the country by calling 1-800-209-4565. 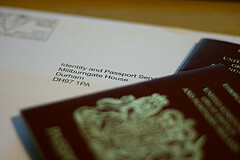 Have you been thinking of renewing your passport? Or perhaps you lost or misplaced it somewhere? If you are planning to travel outside the US, having this document in place would save you much hassle. Nowadays the document is a prerequisite for children too, even if they are traveling with their parents. So, if you have a family trip planned to an international location, choose convenient passport application processes. The US Department of State has officially appointed some agencies to expedite the process. Whether it comes to fresh applications, lost or stolen passports, or renewal, these agencies can help you with anything related to passports. If the date for the international trip is too close, go for agencies that offer same day services for your application, among their other services. Look for websites of authorized agencies that expedite US passport applications. Whatever your passport-related requirement, be it for a child, services for damaged passports, or renewing them, choose the service you want on the website of the agency. With electronic facilities to simplify every step, getting your application approved is simply a matter of filling up relevant information and having the appropriate documents in place. You can place an order electronically or send your application via Fed Ex. With guaranteed passport issue in as little as a day, you not have to worry about any complications. The best part about these agencies is they can resolve any issue you may have with the process of applications. You can choose live chat service on the website of such agencies and get all your passport-related queries answered. Missing or stolen passports, renewing them, applying for a fresh one, whatever your requirement, the agencies are up to the challenge of delivering, even at a day’s notice. Not only same day service, you can choose a period of upto 8-10 business days for delivery. Whichever the period you choose, these agencies guarantee to delive right at home. With a wide network of contacts in different international locations, authorized agencies know all about the updated rules and regulations for travel. When they process your application they make sure that it follows the latest US rules for traveling to that location. With the passport made out according to the updated rules and procedures, you always travel with a secure mind. The next time you have an international trip planned, choose an official route to get your US passport application approved quickly. Most travel experts recommend that you apply for a passport months before you actually plan to leave the country. However, life can be unpredictable, and there are a variety of circumstances that can leave you scrambling at the last minute to get a passport, fast. When you apply for a passport, it normally takes the State Department at least six weeks to receive your application, evaluate it, process it and send the new passport back to you. If you can’t wait that long, follow one of the procedures outlined below to get your passport more quickly. If you still have more than two weeks before you’re scheduled to leave the country, applying for expedited passport processing through the Department of State is an option. On top of the normal application fees, you’ll pay an additional $ 60 expedite fee to the State Department. To ensure you get your passport in time, the State Department recommends that you spring for overnight service to and from the passport office. The cost for overnight service to the passport office will depend on whether you use the post office or another carrier, and the cost from the passport office is $ 12.72. If you apply for expedited service with overnight shipping, you should get your passport within 3 weeks, though the actual processing time may be shorter or longer depending on how many applications the Department of State has to go through at any given moment. If you plan to leave the country within two weeks and you don’t have a passport, you can make an appointment at a regional Passport Agency office by calling 1-877-487-2778. You are also eligible to make an appointment if you are traveling within 3 weeks to a country that requires American citizens to apply for a visa in advance. As long as you have all of your paperwork in order, you should be able to get your passport fast, usually within 24 hours of your appointment. Along with the other required fees, the $ 60 expedite fee will apply. However, there’s a catch: there are only 24 of these passport offices in the entire US, mostly in major metropolitan areas. So, visiting a passport agency may require a long drive or even a plane trip. If traveling to a passport agency isn’t feasible or seems like too much of a hassle, you can pay a company to do it for you. If you need to apply for your new passport in person, all you have to do is go to the post office (or another passport acceptance facility), fill out the application and get your documents “sealed” by the passport agent. Then, send them to the expediting company and the company will dispatch an employee to take them to the Department of State for you. Convenience will cost you, though – in addition to the standard government fees and the $ 60 expedite fee, you’ll have to pay the expediting company, too. I need to renew my passport ahead of a planned trip to Japan this fall. 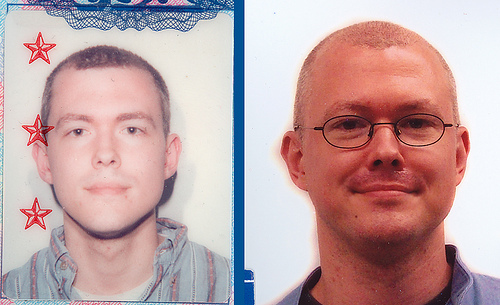 Part of the process is sending in your expired passport, and I was struck by the changes in the past 12 years. The guy on the left was also already married to Molly, though – which is pretty cool.